Black Orpheus ascends a break in a huge overhung headwall via a cleanly fractured dihedral and has some of the best moderate crack climbing at Red Rocks. An initial dihedral has a few awkward sections, then a long broad slab leads up to a traverse below the headwall. The reward is the excellent upper dihedral with tons of fun climbing and a short bolt-protected crux. Which SuperTopo guidebooks include a topo for Black Orpheus? George and Joanne Urioste accomplished the first ascent of Black Orpheus in April 1979. It was not a good time for the Uriostes. They were divorced. Though plagued by uncertainty and facing serious life decisions, they were united by a common love for climbing. A reconnaissance up the first few pitches looked very promising. The dark, south-facing rock was warm and pleasant in the still-cool spring air. The initial pitches went free and assured easy access to the spectacular crack and dihedral system on the upper part of the route. They returned optimistically, with the intention of climbing through to the summit in one push. The climbing went well. 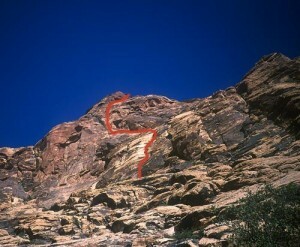 They quickly achieved their previous high point and continued onto the upper cracks. As they reached the top of their thirteenth pitch, both daylight and crack were fading. Faced with drilling several bolts to protect the face climbing that separated them from the summit, they had no choice but to bivouac. Even then, their options were limited. There was no ledge big enough to stretch out on, only big enough for sitting. And, ironically, there was no spot big enough for them to sit together, so the maritally torn climbers endured the cold April night on separate ledges high above Oak Creek. When morning finally arrived, George set out to lead the face pitch. Tired, stiff, and debilitated from the rough night, he drilled the four protection bolts on the pink face. Above this pitch the difficulties faded and the climbers were soon unroping on the summit slabs. Black Orpheus ascends a break in a huge overhung headwall via a cleanly fractured dihedral.